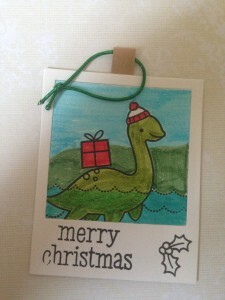 I am loving shaped tags this month. It is just a fun way to practice my coloring and scene creating without having to plan an entire card. 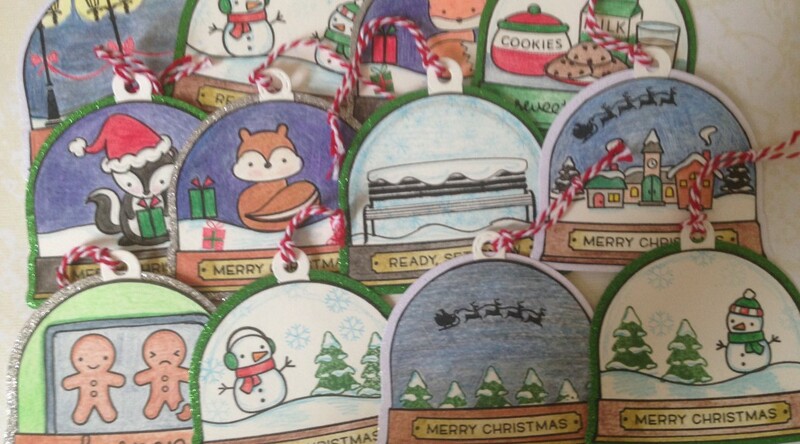 I made 12 snow globe shaped tags today. 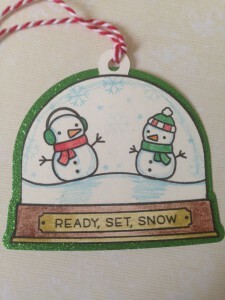 I just bought Lawn Fawn’s Ready Set Snow stamp set and the add on dies. 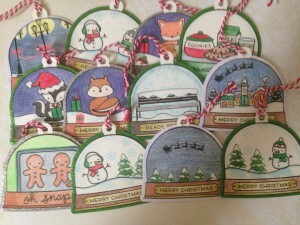 Today, I just made regular tags; I hope to try some shaker tags soon. 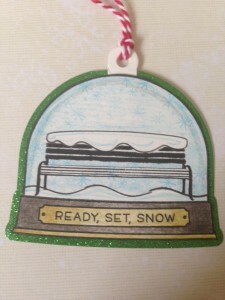 Extra Details: I started by stamping a full sheet of card stock with the snow globes, 12 in total. Then I filled in my scenes. I used Post It note tape to do any masking that I needed to do. 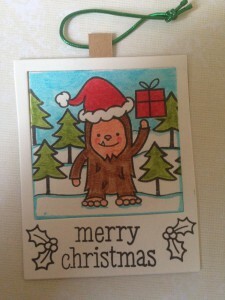 After all the stamping was complete, I colored everything in with colored pencils. It was a lot of fun to try different ways to shade and color layer all these images. 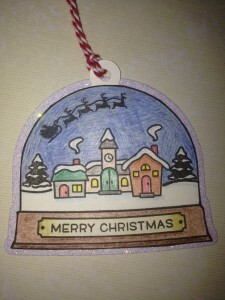 When all the coloring was complete, I fussy cut each of the snow globes out. I lined the edges with a black marker to help hide any cutting imperfections. 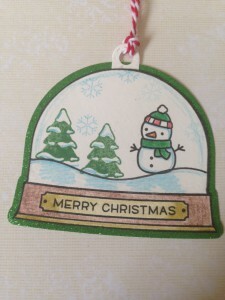 Using the die cut, I cut twelve snow globes from glitter paper to layer behind my stamped images. I also added a small tag with a hole in between the layers. 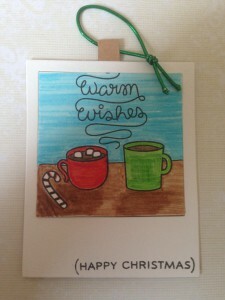 I used this tag to attach some red and white twine. 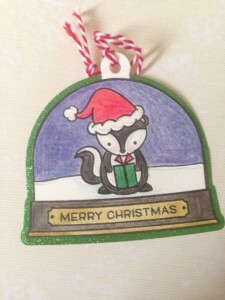 I’m on a Christmas Tag kick all of a sudden. I love this gumball machine, but I haven’t really figured out what to do with it yet. 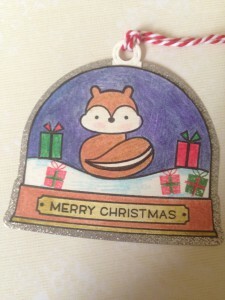 I thought it would be fun to fill it with candies that have Christmas images on them. Be forewarned, there was a lot of masking involved. I ended up with 15 tags total. Extra Details: I started by stamping the gumball machine as many times as I could on a full sheet of card stock. (15 times to be exact) Then using Post It tap, I stamped the little images on the gumballs. All 15 tags have the same images. I used colored ink when I had too. Next was coloring, lots and lots of coloring. I used colored pencils to color everything in. I mostly stuck to the traditional red and green colors. I added a little light blue just for interest. 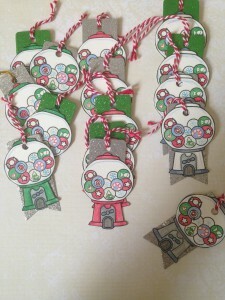 Then, I fussy cut each gumball machine out. Luckily, the shape was fairly simple so it didn’t take too long. I lined the edges with a black marker to help hide any cutting errors. 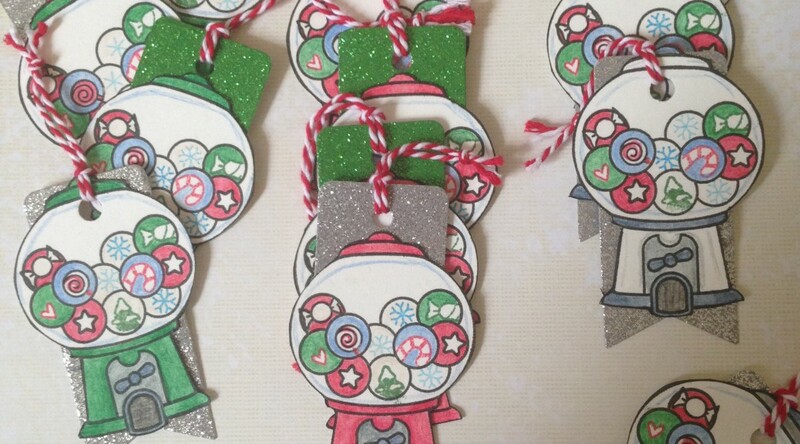 To make the gumball machines into tags, I added a glitter tag to the back of each. Some just got the top park of a tag and a few got a whole tag. 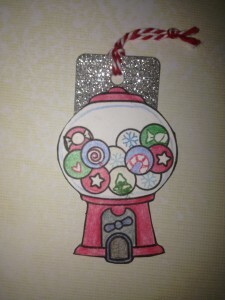 I didn’t have enough glitter paper to give each gumball machine a whole tag. I was trying to use up some scraps. 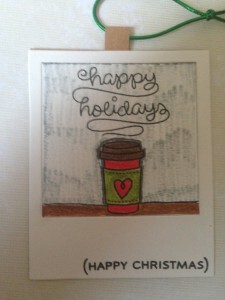 I added some red and white twine to the top of the tags as a finishing touch. 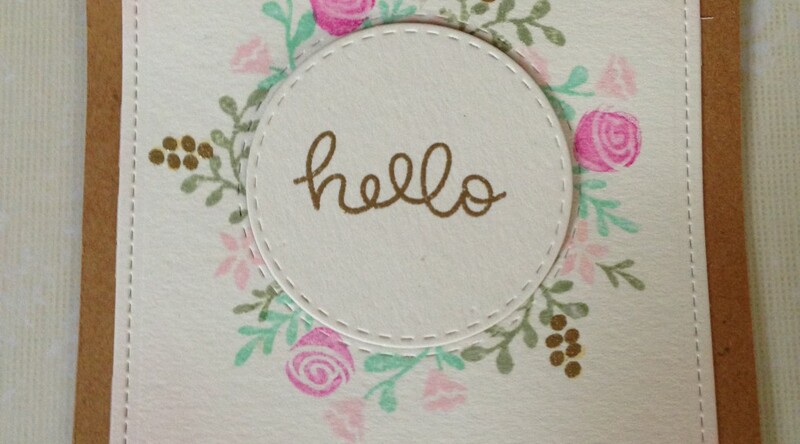 Somewhere I saw a beautiful card that was all light pinks and golds. I loved the color combo and wanted to play with it myself. I have no idea what I am going to do with card, expect stare at it. 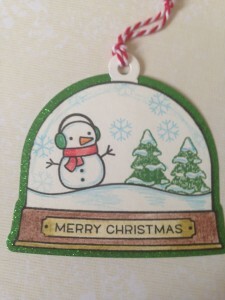 Extra Details: I started by die cutting a stitched rectangle from water color paper. I cut a smallish stitched circle form the panel and set it aside. 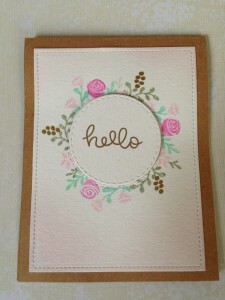 Using my Distress Inks, I stamped the floral images around the circle. I used a damp paintbrush to even out the Distress inks. 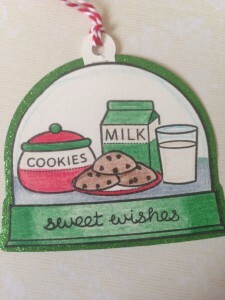 I also ink blended the edges of the white panel with some Spun Sugar Distress ink. After the Distress Inks had dried, I stamped the berries/dots in Versa Mark ink and heat embossed them in gold embossing powder. I also gold heat embossed the sentiment on the small circle. I adhered everything to a kraft card base. I popped the circle up on some fun foam for added dimension. Stamps Used: Lawn Fawn’s Penelope’s Blossoms. 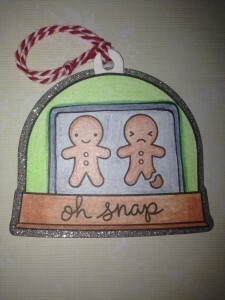 The sentiment is a freebie stamp from Lawn Fawn. One of my cousins just bought her first house. So I started digging through my stamp collection and this is what I came up with. 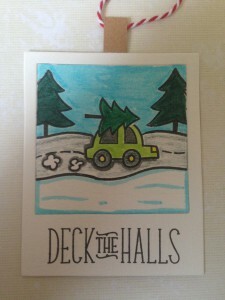 Extra Details: I started by dry embossing the teal cardstock on the background. 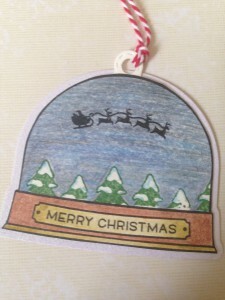 I used a dotted embossing folder from Darice. I dry embossed it three times, offsetting it each time to get a lot of different layers. I then blended some Distress Inks on top of the card stock to help the texture show. Then, I created the focal strip. I used a bit of masking when stamping but it was pretty basic stamping. I colored everything in with colored pencils. I tried to make the small circle at the bottom of the tank look like a soccer ball. My cousin loves soccer and no home would be complete without at least one soccer ball. I added some ink blending to the edges for added interest. Lastly, I adhered everything to a card base. I popped the focal strip up on fun foam. 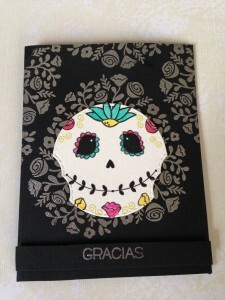 When I bought Lawn Fawn’s Peace Joy Love stamp set, my kiddos took one look at it and loved the skeleton face they saw. It took me about two minutes to see what they saw, and now I can’t un-see it. So, I finally made a card with that idea in mind. Extra Details: I started by making the skull. 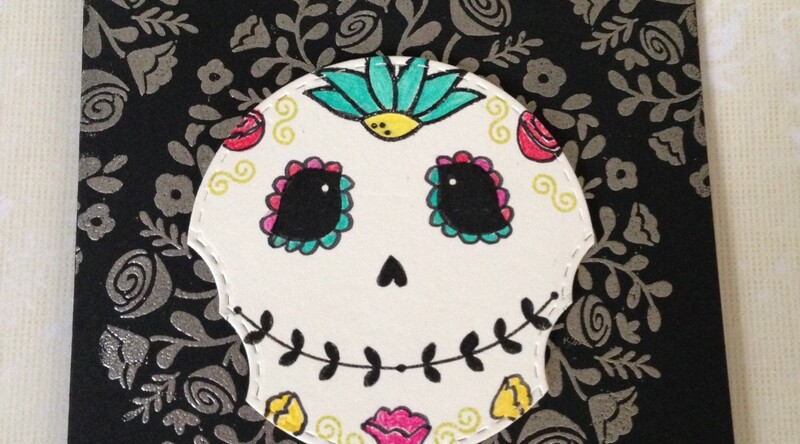 I die cut a stitched circle, then using a smaller stitch circle I notched the edges so it looked more skull shaped. I am not totally in love with the end result, but it gets the idea across. Next, I stamped all of the black images on the skull. I added the scallops to the eyes with a thin black Sharpie. The nose is an upside down heart. I added the colorful decorations next. I used colored ink for the solid images and traced around them in the same thin black Sharpie to keep things consistent. I colored everything in with colored pencils. I also went over the colored images with colored pencils. I used black card stock for the card base. 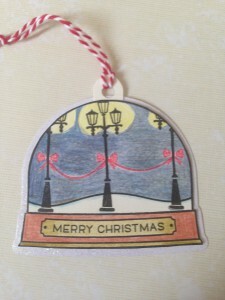 Using Versa Mark ink and silver embossing powder, I created the background. 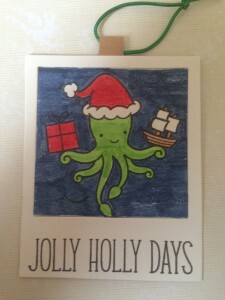 I also embossed the sentiment on the card base and messed it up. So I fixed it by stamping the sentiment on a separate strip of cardstock and popping it up on fun foam. I also popped the skull up on fun foam. Stamps Used: Lawn Fawn’s Peace Joy Love, Fairy Friends, Flirty Frames, and Penelope’s Blossoms. The sentiment was a freebie form Lawn Fawn as well. 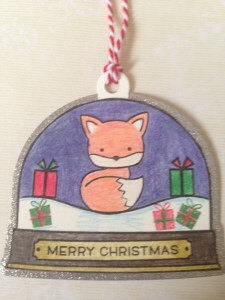 I made more Christmas tags today. 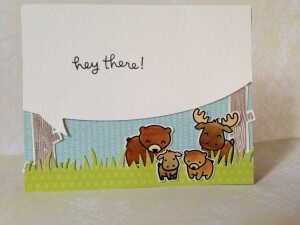 I love my Lawn Fawn Say Cheese die and wanted to use it to make some tags. 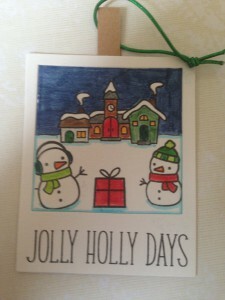 I also had fun using as many stamp sets as possible on these tags. Extra Details: I started by cutting the Say Cheese die as many times as I could from a sheet of water color paper. I stamped the images on the same squares and colored them with my kids Crayola markers. I layered both pieces on a slightly smaller piece of kraft card stock. I also sandwiched a small loop of kraft paper between the layers to hold the ribbon. 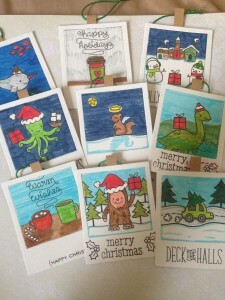 Stamps Used: Lawn Fawn’s Critters in Costume, Deck the Halls, Happy Trails, Lovable Legends, Love You A Latte, Mermaid for You, Oh Snap, Ready Set Snow, Winter Gifts, and Year Two. A family friend is working at an amusement park this summer and her birthday is coming up soon. 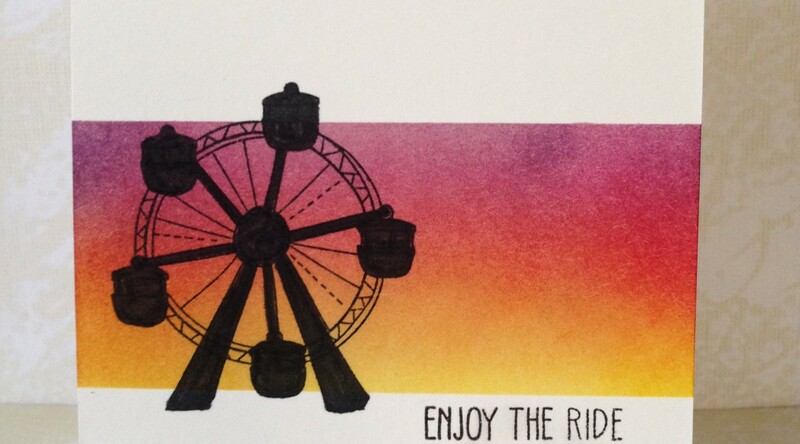 So I made her a birthday card featuring a Ferris wheel. Extra Details: This is a one layer card. 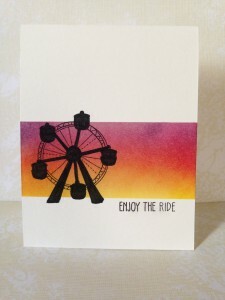 I stamped the Ferris wheel on the card base and masked off the strip around it. I ink blended in the exposed strip to create a sun set feel. After the ink blending was done I stamped the sentiment. Lastly, I colored parts of the images with a dark black marker and the card was done. 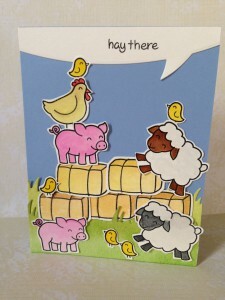 While I had my Critters on the Farm set out for the You Moooved cards, I stamped the other critters out also. 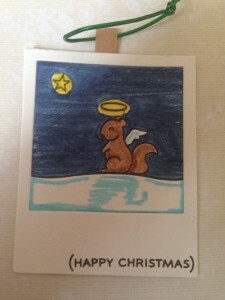 This is the card I made with the other images. 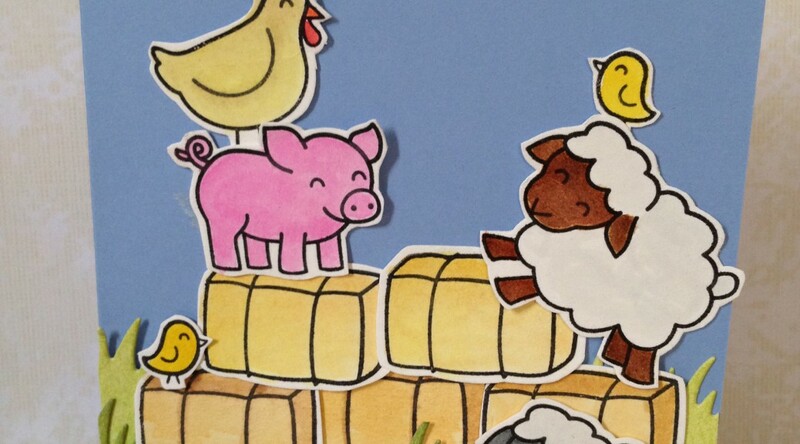 Extra Details: I water colored all of the images with my Distress Inks and fussy cut them out. I also made two layers of grass and ink blended those. I adhered everything to the light blue card base with Be Creative tape. Friends of mine recently moved. 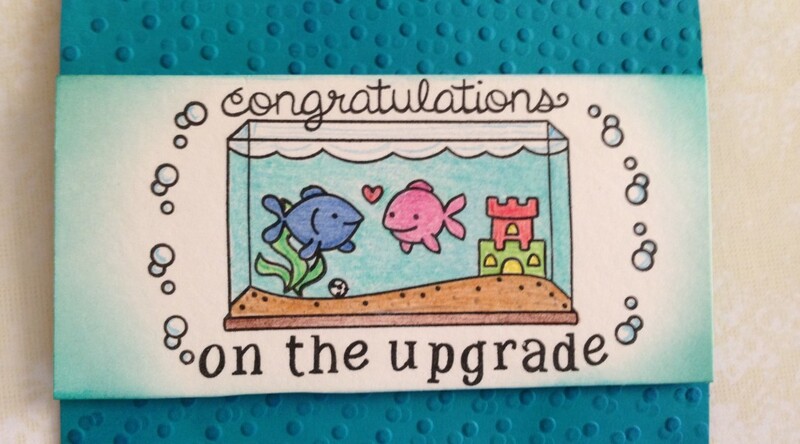 I made them this card. My friends loved their card so much that they asked me to make them a similar card. This is the second card I made. I stepped this card up a bit. 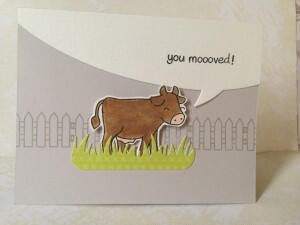 Luckily for me, I hadn’t blogged this card yet, so both cards can be in one post. 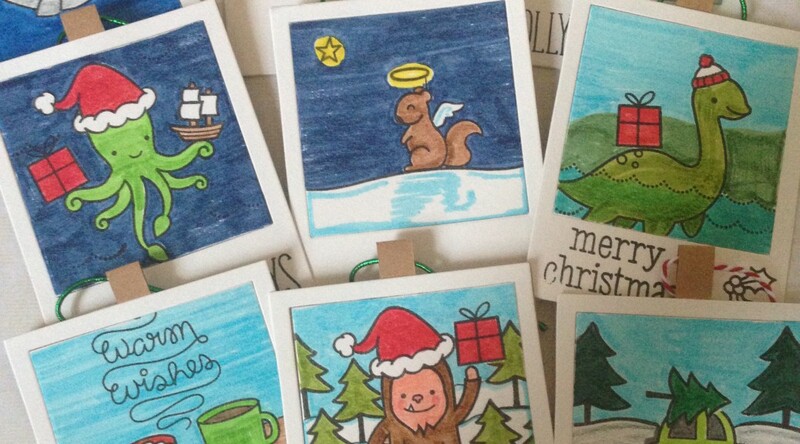 Extra Details: I water colored all the images on these cards with Distress Inks. 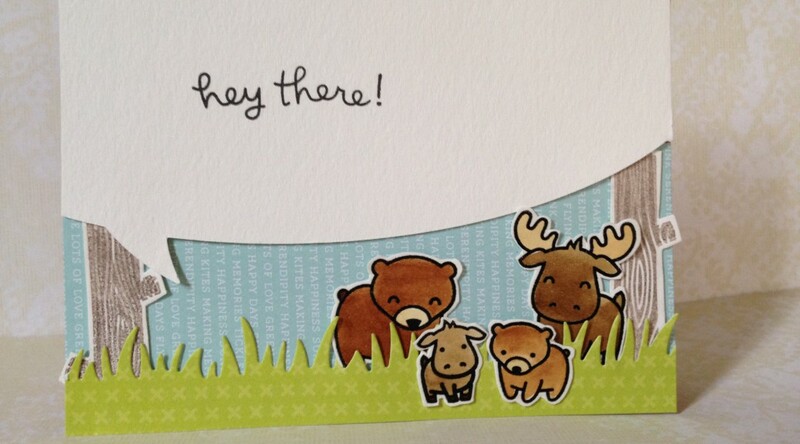 The first card was pretty simple; just a few die cuts and some stamping directly on the card base. The second card has some layers of grass that I ink blended. 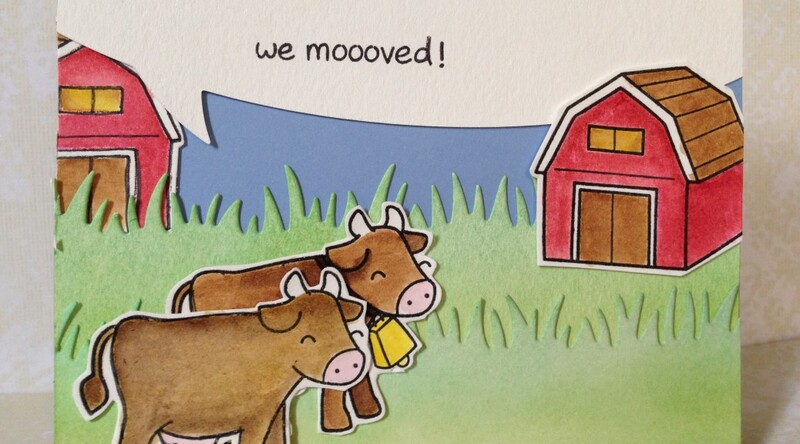 I also added some barns and an extra cow. 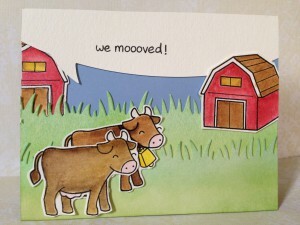 Both sentiments are made up of various sentiments from the Critters on the Farm stamp set. Distress Inks in Aged Mahogany, Brushed Corduroy, Cracked Pistachio, Fired Brick, Ground Espresso, Mowed Lawn, Mustard Seed, Picked Raspberry, Tattered Rose and Walnut Stain. It was time to clean out my box of extra colored and cut images again. 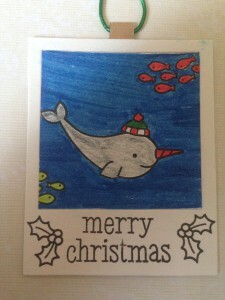 I created this card for my nephew. Extra Details: I started with the images that I had already water colored using Distress Inks. Then, I worked on the scene for them. I only had a small strip of the blue patterned paper left so I made the speech bubble extra big. I also added some grass to help ground the critters. I thought the scene was lacking something, so I added the tree stumps and was happy with the layout. 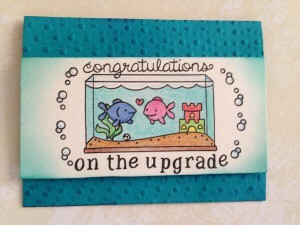 I adhered everything to a card base using Be Creative tape and stamped my sentiment. Paper: Pattern paper scraps were left over for the Simon Says Stamp March 2016 card kit.